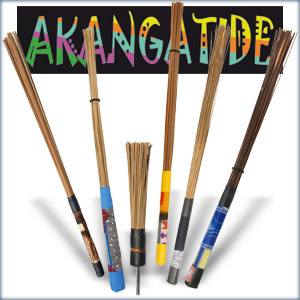 AKANGATIDE produce a special kind of brushes and multi-rods. Unlike the wicker-based rods of the mainstream manufacturers, Akangatide uses an especially flexible and wiry bamboo/grass that is indigenous to Cameroon only. Even the thinnest strands show surprising rigidity and strength. Due to the great number of strands in Akanga rods, sufficient force can be applied to ensure a powerful sound when needed. Recently the same principle has been carried over to the bass drum beater. It is in no way restricted to the bass drum, this beater can be applied with equal success to the cajon! The latest addition to the roster has been a series of handheld percussion instruments.